Astronomy is one of the oldest sciences. A science which to this day gives us new insights about the origins of the universe and what is happening in it. Every day we discover new stars and planets in the far corners of the universe. The closest star to the Earth is the sun. In sequens turning around the sun are the two inner planets Mercury and Venus, the Earth which her the Moon and the outer planets Mars, Jupiter, Saturn, Uranus and Neptune. 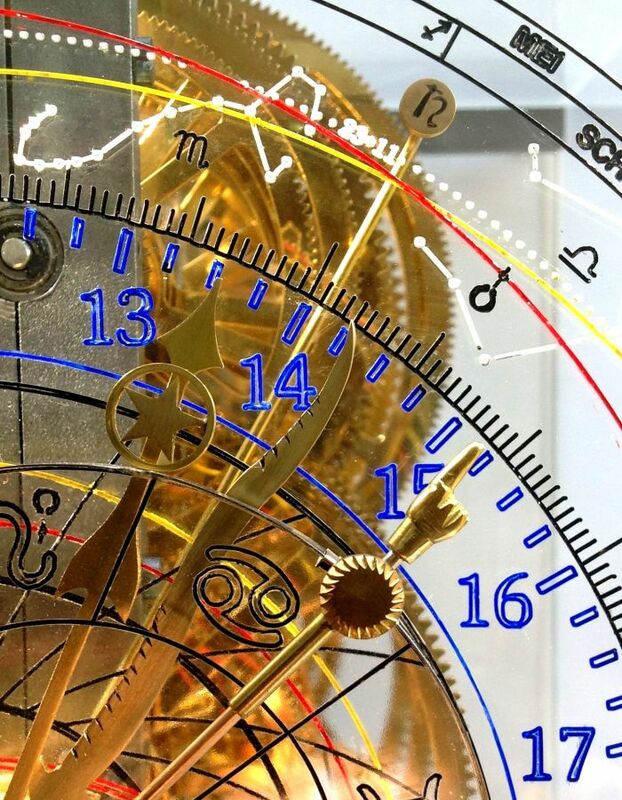 Niek Swelsen designs and builds mechanical and astronomical clocks. Astronomical clocks are divided into astrolabes and planetariums. 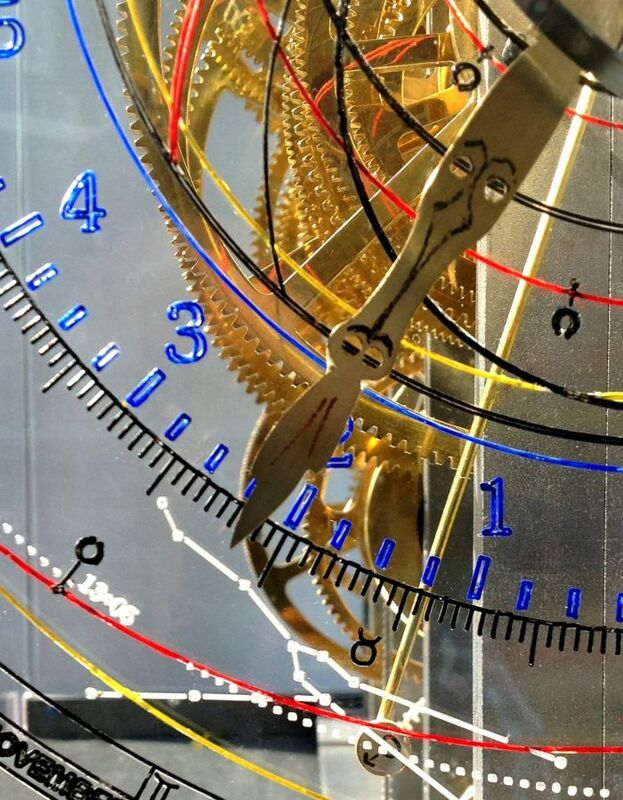 By exploring the extremes in mechanical wheel transmissions we have succeeded in designing astronomical clocks with a theoretical accuracy of less than 5 seconds per year. By diverting from traditional wheel positions we have designed an astronomical clock on two axis and one drive shaft. Our astronomical clocks have an open design and are placed on a portable stand. The mechanics of the clock are clearly visible through the transparent casing. 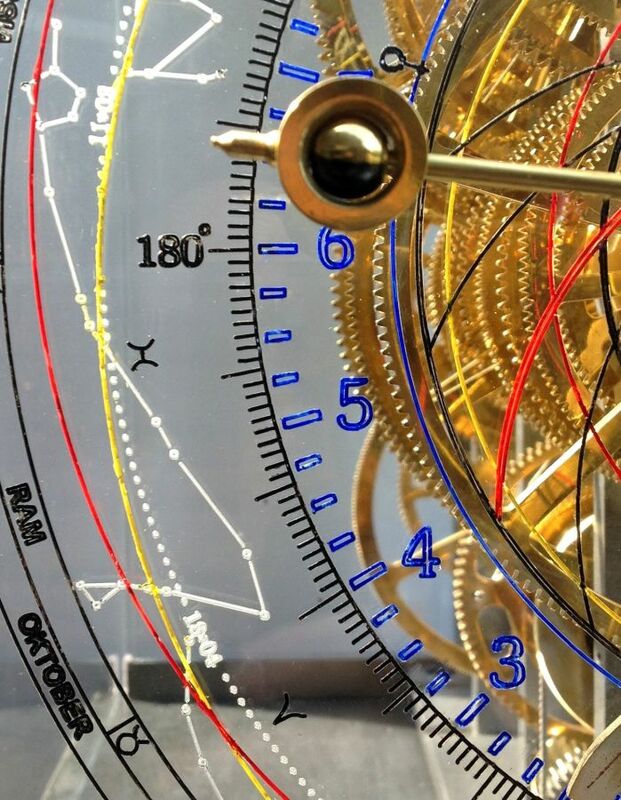 In this video you can see the astrolabe speeded up turn clockwise for 6 days. The six planets on the planetarium turn counter clockwise around the sun. The sun is imaginary positioned in the middle on the clock. The Earth passes the vernal equinox on the 20-21th of March (at 0 degrees) while the sun projected on the ecliptic passes the point of 180 degrees. Because the Earth passes the vernal equinox, the sun moves from the zodiac sign “Pisces” to zodiac sign “Aries” on both the astrolabe and the planetarium. The further a planet is positioned form the sun, the longer is the time to turn completely around the sun. The movement of the two inner planets Mercury (326 degrees), Venus (214 degrees) and Earth are well perceived. The Mars circuits (214 degrees) Jupiter (6 degrees) and Saturn (72 degrees) are barely observable because the recording time of this video is very short. On the astrolabe the sun rises at 05:50 am and sets at 06:10 pm. In the last quarter the phase of the moon diminishes towards “new moon”. Astronomy is one of the oldest sciences. A science which to this day gives us new insights about the origins of the universe and everything in it. Every day we discover new stars and planets in the far corners of the universe. The closest star to the Earth is the sun. In succession turning around the sun are the two inner planets Mercury and Venus, the Earth which her the Moon and the outer planets Mars, Jupiter, Saturn, Uranus and Neptune.